WMAP is an explorer launched by NASA in June 2001 which successfully produced a new Standard Model of Cosmology. It was tasked with measuring the faint cosmic background radiation left over from an early developmental stage of our universe. In the beginning, before God, the universe was filled with a uniform glow from its white-hot fog of hydrogen plasma. The expansion of the universe continued with the plasma and radiation filling it becoming cooler. This led to protons and electrons forming neutral atoms. Atoms thus formed stopped absorbing the thermal radiation resulting in a transparent universe instead of an opaque one. The WMAP science team has determined, to a high degree of accuracy and precision, not only the age of the universe, but also the density of atoms; the density of all other non-atomic matter; the epoch when the first stars started to shine. The present age of the universe that our solar system is a part of is said to stand at 13.77 billion years and counting, while the Cosmic Microwave Background is the afterglow of a young universe at only 375,000 years old. The WMAP observation lends credibility to the theory of an ‘inflation’ period for our universe where it expanded dramatically, growing more than a trillion trillion-fold in less than a trillionth of a trillionth of a second. Tiny fluctuations were generated during this expansion that eventually grew to form galaxies. The exploration probe was able to determine the varying amount of components that constitute our universe. 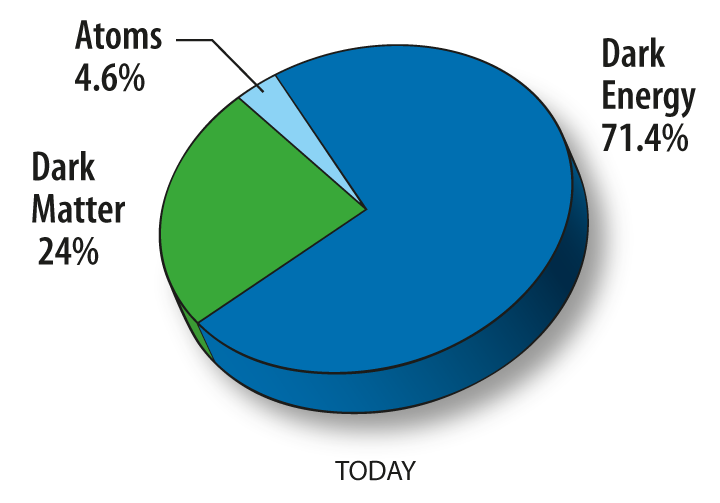 Atoms that make up human beings, animals, plants, planets, stars and galaxies account for a meager 4.6% of the total. A different kind of matter that has gravity, but does not emit any light, called dark matter constitutes 24%, while the majority of our universe is composed of dark energy, which acts as a source of anti-gravity and is accelerating the expansion of the universe. Why are they given names like dark matter or dark energy? Well, for one noone knows what it is and of course they aren’t emitting any form of light either. We are ordinary(?) matter and we don’t emit light either but atoms in stars are capable of it. Is dark energy an area of the universe where the stars have failed to form? All the while we bicker and fight over local economy and destruction of our natural habitat, dark energy menacingly pushes away all our neighbouring clusters of galaxies, gradually isolating atoms to a cold and dark end.